The Ananda Marga Primary School at Hetauda, Nepal has six classes from grades 1 to 6, plus a Kindergarten I class and a Nursery class. The school, with Didi Ananda Radhika as the principal, has at this time about 80 students. Hetauda is a smaller town situated in the south of Nepal, approximately 3 hours from the border with India. When I took over the school 7 years ago, it had hardly any playground or boundary wall and no plastering on the school walls. The school has developed bit by bit in appearance, decoration and standard of teaching. The teachers are constantly being guided on the lines of Neohumanist Education”. It has seven teachers and serves the children of families from the village areas at the edge of the town. All the teachers are students themselves, studying various educational subjects when they are not teaching. Nepal has many village areas where there is need to open more schools. Often you can find that children cannot attend school at the proper age and attend grade one at an older age. The school building with eight classrooms resounds in the mornings with the chanting of learning the sounds of Nepali and English letters. It is amazing how children study to speak, read and write in Nepali as well as in English, learning all sounds and letters from an early age on. At our school the children have assembly time with meditation every morning. It’s a colorful picture when they assemble in the school ground outside. The playground with a bit of garden at the edges is a great plus for the school. Along with their studies the children have time for games, hide and seek and running etc. The students also get art training and physical education as per the standards of Neohumanist Education. This was demonstrated when only last month the school won a prize for their physical education. It won the 3rd prize in the District Level Parade Competition where 15 other primary and secondary schools participated. The event was inaugurated by the District Education Officer and was carried on in the presence of other honorary guests. 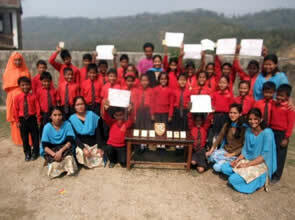 I came for 2 months to Nepal in January to do some work in Didi’s school. I was welcomed open heartedly and Didi fit me into the school’s schedule. Besides teaching English conversation, grammar and some essay writing I practiced with the children English songs, circle rhyme songs with movement and some arts and crafts. Mostly I was teaching in grades 2 – 6. We added more creative activities into the curriculum like painting, collage and making mobiles out of bark, paper and cloth. The artwork was hung up in three rooms of the school. Under the motto: “I draw myself” children drew pictures and we decorated the walls with them also. A member of Ananda Marga and homeopath, Krsnadeva from Sweden, donated money to the home and school. From this we bought various supplies like wall paint, school shoes, art materials like brushes and paints, a notice board and still Didi Ananda Radhika has money left to purchase parts for her sound system in order to be able to amplify sound for cultural music and performances. At the end of my time I painted some school room walls with the help of the Didis and the entrance gate to the school. I was glad that I found that I could contribute something to the school’s program. In Nepal there is something called “Sharing the S ilence”. I found that people here are self contained (especially when I met some Nepali members of Ananda Marga), following Santosa (contentment) and know when to speak or not. 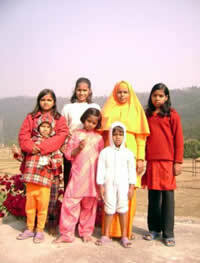 The nearby mountains also provide a good place for Sadhana (meditation). If anyone wants to work as a volunteer in the educational field in the Hetauda School please write to Didi Ananda Radhika at: anandaradhika ntc.net.np. You might like to combine this with a visit to the Mt Everest region, because it is a beautiful and famous area.